Heavenly blog! : No. 1609: Who is the chief of the army of the Lord? Is it Jesus, an angel or who? No. 1609: Who is the chief of the army of the Lord? Is it Jesus, an angel or who? Who is the chief of the army of the Lord? Is it Jesus, an angel or who? Joshua 5. 10 While the Israelites were encamped at Gilgal, and kept the Passover on the fourteenth day of the month at even in the plains of Jericho. 11 And on the day after Easter they ate of the land; unleavened bread and toasted grain they ate that day. 12 And the manna heard the following day, for now they ate of the field of the land; The children of Israel did not receive more manna, but they ate the year of that which was bred in the land of Canaan. / 13 While Joshua was at Jericho, he lifted up his eyes and saw a man standing in front of him with a drawn sword in his hand; and Joshua went to him, saying, Hearken thou unto us, or to our enemies? 14 He said, "No, I am the ruler of the army of the LORD; Now I have come. And Joshua fell on his face to the earth, and worshiped, and said unto him, What is my lord saying to his servant? 15 And the captain of the army of the LORD said to Joshua, Take off your foot! The place where you stand is holy. And Joshua did so. The chief of the Lord's army is of course no one other than Jesus. He was, he is, and remains. Joshua did as Moses when he met the Lord, took off his shoes and worship him as Tomas did. Yes, the chief of the army of the Lord is none other than Jesus, no one else can bear that title! Reason The text reads: The boss in God's own army is the best to translate the captain of the Lord's Army. Or this too: the Universe Regent. From my commentaries Revelation 19 11 Then I saw heaven open, and behold there was a white horse! He who rode on it is called "Faithful and True," because he judges and fights righteously. Who is this man on the horse? It is Jesus Christ, the Son of God and God Himself! He is invincible when he has already fought evil on Calvary and victory has been won and the basis for all other kinds is shadow boxing to count on the fight against Calvary and Gethsemana. Kol. 2. 15 He disarmed the powers and the authorities and made them mock and speeding when he triumphed over them on the cross. 12 His eyes are like flaming fire, and on his head he has many crowns, and he carries a inscription with a name that only he knows. It is the same trekka because it is the same person we meet in Revelation's book 1. He has many crowns that he has won and fought more battles. The hidden name talks that the strength is not from other people but from the hidden life with his father. Joh. e. 17. 21 I pray that they all may be one, just as you, Father, are in me and I in you. That's how they'll be in us too, so the world will believe you sent me. 22 I have given them the glory you gave me, that they may be one, as we are one: 23 I in them and you in me, so that they can be one. Then the world will understand that you have sent me and that you have loved them the way you've loved me. 24 Father, I want where I am, those whom you have given me will be with me so that they can see my glory that you have given me because you loved me before the foundation of the world was laid. 25 Righteous Father, the world has not known you, but I have known you and these now know that you sent me. 26 I have declared them your name and will do it again, for the love you have had for me may be in them, and I myself may be in them. 13 He is clothed in a robe dipped in blood, and his name is "the word of God." That it is the same man who was hanging on Calvary on the middle tree is clearly here. His name is the word of God. We can not separate Jesus from the word of God and his teachings and teachings. It's the same thing and person. 14 The host of heaven follows him on white horses, dressed in fine linen, white and pure. Who is it that comes with him? His animal and blood bought bride. We are going to go down from the sky on white horses. That we come on white horses bear that we do not come with war but peace. But first, Satan and all his allies must be overcome. Genesis 49. 10 Not a king's spirit shall depart from Judah, not a ruler from his feet, until the prince of peace cometh, and the people shall obey him. 15 And out of his mouth there is a sharp sword; With that he will hit the people. He will steer them with iron rod and steal the winepress filled with angry wine, by the wrath of God Almighty. When Jesus will rule this earth for 1,000 years, it is not that everything is accepted. It is with a clear mandate from his Father about how everything should be from A to. It is with iron rod and the one who disobeys the Lord will die and not rain. All aftermaths after people and Satan's regime will be removed, but it will also be a settlement hour for all nations how they have stood before Israel and how they shared the land to the Jews just as it suited them. and bring them down into the valley of Jehoshaphat. as they scattered among the people. 16 On his cloak by the hip is a name written, the king of the king and the lord of the lord. This name is no longer hidden. Now it is obvious what name the Father has given him. Then everyone else must relate to him, based on who they really are dealing with. Do not baby Jesus or the suffering Jesus, but the holy one. File. 2. 9 Therefore God hath exalted him and given him the name of all names. 17 And I saw an angel standing in the sun. He cried out loudly to all the birds flying under the sky: "Come here, come together to the great feast of God! That what is going on here is terrible. Through the great tribulation more than half of the world's population will die in just the two great wars. Gog war and Armageddon battle. There is a hatred and fury against God, his congregation and Israel underlying. Matt. 24. 28 Where the cavity is, the vultures will gather. Åtsle is Israel and the vultures are all the nations of the world who go with the Antichrist in the history of the world, the greatest and last field of rebellion. 18 You shall eat meat of kings and armies and heroes, flesh of horses and their riders, flesh of all men, free men and slaves, small and great. " We read about this war more places in the word of God. Blue. matt. 24-25, Mark 13 and Luke 21 that there is such open flesh can not be understood in any other way that here is all the latest and worst and deadly weapon that is not only threatened but used in combat. There is much talk that those who attack Israel will also turn to each other when they see where they are carrying. 19 Then I saw the beast and the kings of the earth with their armies gathered together for war against the rider of the horse and his army. 2. Tess. 8 Then shall the lawless be seen. But on the day the Lord Jesus comes in His glory, He will exterminate Him with the breath of His mouth and destroy Him. 20 But the beast was taken, and with it the false prophet, who underwent the service of the beast, and with them seduced all who took the mark of the beast and worshiped the image of it. Both were thrown into the fire, burning with sulfur. Here the animal - Antichrist - is caught in with the false prophet, there are many false prophets but only one who is the false prophet. They are thrown into the fire, which is the beginning to the end of their case. That they are thrown into the lake of fire tells them that they will never again have the opportunity to repent and when the fire has made its effect it has been removed forever, even their bodies, soul and the spirit has returned to God who gave it. 21 The others were killed with the sword coming out of the rider's mouth. And all the birds ate their meat. It is stated here that the others were killed with the sword and the birds ate their meat. This we must understand as car sharing speech and it is talked that Satan and everyone who went with him got to show their true me and eventually their path became. God is fair that lets everyone have an opportunity to show who they really are. Who and where was Jesus before he became human in his prelude? We meet Jesus many, many places in the GT. Blue. As the chief of the Lord's arms in Joshua 5, I am convinced. He was the son of God long before he became human. There are more views on Jesus' preaching or pre-existence. A new spiritual direction teaches the way I understood that Jesus was the Word that was with God's Father without being an individual. That the Holy Ghost is not a personal person, it is very clear from the writing something that I have taken up so much that I do not want to spend time but ask the readers to look at our website and the blog for this topic. Here's what they learn briefly: "Jesus was only in the Father's mind and he was the Word who became human without a pre-existence before he came to the world. "This is briefly, but does this correspond to the writing? Mika 5. 1. But you, Bethlehem, Ephrath, the poorest among the clans of Judah! From you I will come to a man who will rule over Israel. He has its origins in ancient times, he is from ancient times. Prov. 8. 22 I was the first thing the Lord brought forth, his first work in ancient times. 23 In the beginning, I was formed, in the beginning, before the earth became. 24 I was born before the deep sea was there before the wells were filled with water. 25 Before the mountains were set in place before all the piles were born, 26 before the Lord created land and soil and the first mold on earth. He was revealed in human form, won his right in the Spirit, was seen by angels, preached to the people believed in the world, taken in glory. Who is he? There are many biblical translations that write God clearly in flesh, but in the text, it is not said God, but he or Christ, who is the angel of the Lord. But it was God's Father who made him reveal himself. We can thus conclude that Jesus has a beginning and then a preaching. Everything else without this will be tampering with the scripture! But when Jesus came into the world, he was by what scripture says no god but Christ, the anointed manifest in the flesh, meaning Messia s or he waiting for. Jesusmet all the challenges that 100% human and 0% as god. He had to become human like us in full, as he had to pay our sin as human, not as God, and know that he can understand us when we come in temptation, or if he is tried in everything like us, but without vision. If one claims otherwise, the work of Jesus was not perfect, then it was fabricated and made by God and not a human being. But the scripture is clear of this many, many places, although the false teaching called Trinity teaches claims otherwise. It just tells me what forces from the abyss that are behind this teaching. Jesus died as a human being and resurrected as human, but after the resurrection, he returned only to an even greater extent. Room. 1. 2 This gospel has given God promise in advance through His prophets in holy scriptures, 3 the gospel of His Son, Jesus Christ our Lord, as a man of the tribe of David 4 by the Spirit of Holiness, as the mighty Son of God when He stood up from the dead. Once we have documented that neither the Trinity doctrine nor the teaching that Jesus had no preaching, let's stop by that side of Jesus' preacher who speaks more strongly that he was before Abraham and everyone else. And that he has existed from the days of the time and until he was born as a human being into this world 2,000 years ago in the age of time. The angel of the Lord is Jesus's clearest title in the GT, while in the NT he is the Son of Man and the Son of God. And when it says that the angel of the Lord went with the children of Israel, it was Christ who went with them. Isaiah 63. 9 In all their tribulation there was no tribulation, and the angel of his sight saved them; in his love and great mildness he redeemed them, and he took them up and carried them all the days of old. 1 Cor. 10. 1. Brethren, I want you to know: Our fathers in the desert were all under the cloud, and they all went through the sea. 2 Everyone was baptized to Moses in the cloud and in the sea 3 and they all ate the same spiritual food 4 and drank the same spiritual drink. For they drank the spiritual rock that followed them; This rock was Christ. I have to say a big hallelujah. It was Christ who went with them saying Paul and Isaiah say that it was the angel of the Lord or the presence of his face, which shows that it was the same person. In several places in the Old Testament we meet the phrase 'angel of the Lord' or 'angel of god'. This is a person who is so close to the Lord himself that they can not be separated. In some accounts, the expression "angel of the Lord" and "the Lord" alternates so that we get the impression that there is one and the same person in question. This is what we see in Genesis chapter 16 in the report of Hagar. In v. 7 it says: "The angel of the Lord found her in a spring in the wilderness, at the source on the road to Sjur." But in v. 13 it says: "Then she gave the name of the Lord, who had spoken to her," You are God who sees. " For she said, "Have I really seen a glimpse of him who sees me?" "
We read in Exodus 3.2-4: "The angel of the Lord appeared to him in a blazing fire, which struck up from a thorn bush. With one he saw that the bush was in a light hat, but it did not burn. Moses thought to himself, "I want to see this wonderful sight that the bush bush does not burn." But when the Lord saw that he came down to see, he shouted out of the thorn bush: "Moses, Moses!" In the account of Gideon, we read in Judgment 2.1: "The angel of the Lord came from Gilgal to Bokim, saying, I brought you up from Egypt, and brought you to the land which I oathed with your fathers. " These two examples also show that the names 'Lord and Angel of the Lord' are sometimes used for each other. In the Danish Solomon's lexicon theologian FC Krarup writes about "the angel of the Lord" that "it is especially in the ancient history of Israel that it is spoken of the angel of the Lord, as many theologians, both in the past and in the past, have regarded as an early revelation of the other person in the trinity. " The Norwegian Pentecostal Prof. IHH Brochmann writes on page 82 of the Lutheran Foundation's Bible work: "Out of what is said in the GT about the" angel of the Lord, "it has been believed to be the same as the" Son of God. " "The angel of the Lord" in the Bible probably refers to Christ. In addition to the examples we have examined, there are several other texts from the Old Testament where these expressions are used synonymously, see, for example, Genesis 21,17; 28.13; 31.11; Judgment 6.12; 6.23;Genesis 48, 15-16; Template 3.1. There is therefore no strange thought for the Old Testament that God reveals himself through a messenger or angel, which apparently is also identical to God. Now we do not believe in any Trinity as it is not the Bible's teaching, but that Jesus has a preacher who teaches the scriptures. But then, as the Lord's angel in singles, when God's Father also has more angels performing his duties like Gabriel, Michael, etc. The angel of the Lord is what is the most prominent title, and it is Christ's most mentioned as in the writing of the GT, while in NT is it more than one who occupies that position, it seems? 1Mos 16: 7 But the angel of the Lord found her by the water of the wilderness, by the well of the way to Sur. 1Mos 16: 9 Then the angel of the angel said to her, Go back to your maiden, and bend under her! 1Mos 16:10 And the angel of the Lord said unto her, I will make thy seed such a plate, that it shall not be numbered for many. 1Mos 16:11 And the angel of the Lord said unto her, Behold, you are fruitful, and shall bear a son, and you shall call him Ishmael; for the Lord has heard your need. 1Mos 22:11 Then the angel of the Lord cried to him from heaven, saying, Abraham, Abraham! - He replied: Yes, here I am. 2Mos 3: 2 And the angel of the Lord appeared to him in a fiery fire, in the midst of a bush of bushes; and he looked up, and behold, the thorn bush stood in a light hat, but the thorn bush did not burn. 4: 22:22 But the wrath of God arose because he rose, and the angel of the Lord stood on the road to stand him when he was riding on his donkey, and having his two servants with him. 4Mos 22:23 And the angel of the angel saw the angel of the Lord standing on the road with a drawn sword in his hand; then took it out of the way and into the field;but Bileam struck the Ashdeness to turn it into the road again. 4Mos 22:24 Then the angel of the Lord stood on a narrow road between the vineyards, where it was stalked on both sides. 4Mos 22:25 And when the angel of the angel saw the angel of the LORD, he pressed it into the wall, and hugged the foot of Balaam against the wall; Then he hit it again. 4Mos 22:26 Then the angel of the Lord went forth, and stood in a narrow place, where there was no counsel to bow neither to the right nor to the left. 4Mos 22:27 And when the angel of the angel saw the angel of the LORD, he lay down under Balaam; Then Bileam's anger was thrown, and he smashed the ashes with his stick. 4Mos 22:31 And the Lord opened the eyes of Balaam, and saw the angel of the Lord standing on the road with a drawn sword in his hand; then he bent down and fell down on his face. 4:22 And the angel of the Lord said to him, Why have you smitten your donkey three times? Behold, I went out to resist you; for I see that this road leads to corruption. 4Mos 22:34 Then Balaam said unto the angel of the Lord, I have sinned, because I knew not that thou stoodest against me in the way; but if it's yours, then I will return. 4Mos 22:35 The angel of the Lord said to Balaam, "Follow with the men! But speak nothing but what I say to you! Then Balaam followed Balak's chieftains. Judges 2: 4 And when the angel of the LORD spoke these words unto all the children of Israel, weeping the people greatly. Judges 5:23 Forbann Meros, said the angel of the Lord, curse, curse her people, because they did not help the Lord, help the LORD among the giants. Judges 6:11 And the angel of the LORD came and sat under the oak of Ophrah, where Joash of Abiezer's family reigned. Gideon, his son, stood there and threw wheat in the winepress to save it for the Midianites. Judges 6:12 And the angel of the Lord appeared unto him, and said unto him, The LORD is with thee, thou dost fight. Judges 6:21 And the angel of the LORD stretched forth the rod that was in his hand, and touched the end thereof with the flesh and the unleavened cakes; Then the fire rose from the stone and devoured the flesh and the unleavened cakes, while the angel of the Lord went away before him. Judges 6:22 Then Gideon saw that it was the angel of the Lord, and he said, Woe to me, Lord, Lord, who has seen the angel of the LORD before me. Judges 13: 3 And the angel of the Lord appeared to the woman, and said to her, Behold, you are barren, and have never had children; but you shall be fruitful and bear a son. Judges 13:13 Then the angel of the Lord said unto Manoah, All that I have said to the woman, shall she take care of. Judges 13:15 Then Manoah said to the angel of the Lord, Can not make you stay for a while here, so we can make a mess for you! Judges 13:16 But the angel of the Lord said to Manoah, If you make me stay, I will not eat of your food anyway; but if you offer a burnt offering, you shall sacrifice it to the Lord. For Manoah did not know that it was the angel of the Lord. Judges 13:17 Then Manoah said to the angel of the Lord, What is your name? - so we can honor you when your words are fulfilled. Judges 13:18 But the angel of the Lord said to him, Why do you ask for my name? - It's a weird name! Judges 13:20 When the veil rose from the altar to heaven, the angel of the Lord went up into the veil of the altar, while Manoah and his wife looked upon it, and they fell on their face to the ground. Judges 13:21 Since the angel of the Lord appeared no more to Manoah and his wife; Then Manoah understood that it was the angel of the Lord. 2 Samuel 24:16 And the angel stretched out his hand against Jerusalem to destroy it; Then the Lord repented evil, and he said to the angel who destroyed the people: it is enough; Now, take your hand back! Then the angel of the Lord was at the threshing place of the Jebusite, the throne of Arabias. 1 Kings 19: 7 And the angel of the Lord came again, and touched him, saying, Arise, and one. Otherwise the road will be too long. 2 Kings 1: 3 And the angel of the LORD said unto Elijah the tibbish, Arise, and meet the messengers of the king of Samaria, and say unto them, Is it because there is no God in Israel, that you go and ask Baal Sebub, Ekron's god? 2 Kings 1:15 Then the angel of the Lord said unto Elijah, Go down with him, and be not afraid of him. So he got up and went down with him to the king. 2 Kings 19:35 And it came to pass on that night that the angel of the LORD went forth, and smote an hundred and thirty and eight thousand men in the camp of Assyria; And when people rose up in the morning, they saw them all lying like dead bodies. 1Ch 21:12 Whether hunger for three years, or lying down for your adversaries for three months, that you may not flee from the sword of your enemies, or that the sword and the sword of the LORD shall come over the land for three days, and the angel of the LORD shall destroy in all of Israel's landmark! Imagine what I will answer him who sent me! 1Ch 21:15 And God sent an angel to Jerusalem to destroy it. But when he was destroying, the Lord saw that, and he repented evil and said to the angel who destroyed: that is enough; Now, take your hand back! 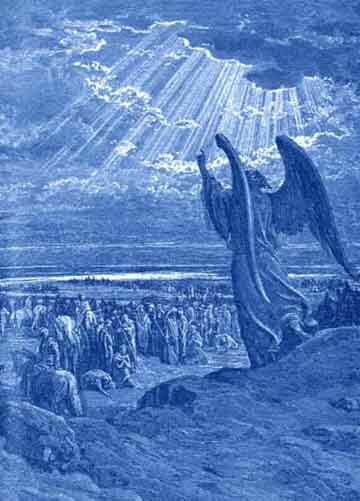 Then the angel of the Lord stood at the threshing-place of Ornan by the Jebusite. 1Ch 21:16 And as David looked up, he saw the angel of the Lord standing between the earth and heaven with a drawn sword in his hand, and stretching it out to Jerusalem. Then David and the elders fell down on his face, clothed in sackcloth. 1Ch 21:18 Then the angel of the Lord of Gad commanded to say unto David, that he should go up to an altar unto the LORD in the threshing-place of the Jebusite the Ornans. Psalm 34: 8 The angel of the Lord will clothe around those who fear him, and he will deliver them. Psalm 35: 5 Let them be as an adversary to the wind, and the angel of the Lord will cast them away. Sal 35: 6 Let their way be dark and slippery, and the angel of the Lord will pursue them. Isaiah 37:36 And the angel of the LORD went forth, and struck one hundred and eighty-five thousand men in the camp of Assyria; And when people rose up in the morning, they saw them all lying like dead bodies. Case 1:11 And they answered the angel of the Lord, who stood still among the myrtle trees, saying, We have gone on the earth, and see that all the earth is quiet and quiet. Case 1:12 Then the angel of the LORD answered and said, Lord of hosts, Lord! How long will it be before you have mercy on Jerusalem and the cities of Judah, for which you have been angry for seventy years now? Case 3: 5 Then I said, Put a clean hat on his head! And they put the clean cap on his head and had other clothes on him while the angel of the Lord stood there. 12: 8 In that day shall the Lord consecrate the inhabitants of Jerusalem, and the one who stumbles shall be like David in that day, and the house of David shall be as God as the angel of the LORD before them. Matthew 1:24 And when Joseph was awake from sleep, he did as the angel of the Lord commanded him, and took his wife. Matthew 2:13 But when they had gone away, behold, the angel of the Lord appeared in a dream to Joseph, saying, Arise, take the child and his mother, and flee to Egypt, and stay there until I tell you. for Herod will search for the child to kill it. Matthew 28: 2 And behold, there came a great earthquake; for an angel of the Lord went down from heaven, and came to and rolled away the stone, and sat upon it. Luke 1:11 Then an angel of the Lord appeared to him and stood on the right side of the altar of smoke. And, behold, an angel of the Lord stood before them, and the glory of the Lord lighted upon them, and they were greatly afraid. Apg 8:26 But an angel of the Lord spake unto Philip, saying, Arise, and go south, on the way that is going down from Jerusalem to Gaza. This road is deserted. Ap 12: 7 And behold, the angel of the Lord stood there, and a light shone in the prison, and he stood by Peter, and woke him up, saying, Hurry up and rise! And the links fell off his hands. Ap 12:23 Immediately the angel of the Lord struck him because he did not give glory to God, and he was consumed by worms and gave up the spirit. The Savior is born - tells a joy great! Luke 2. 11. You are today a Savior born, who is Christ the Lord, in the city of David. Jesus was born, who was Jesus? Jesus was from the time of the time with his Father in his preaching! He is expired from the Father and the Father is equal, but unlike the Father. Jesus became human and renounced his divinity to become you and me and to sin to sin. Jesus has a beginning when he has departed from the Father, it is only the Father who is without beginning. But this I have explained so carefully and well in so many other articles. There are incredible errors in the Bible, especially in the New Testament, when we speak about translation. It was not God, but Christ who became human. We read about how the Catholics and others have translated the Bible wrong. Those who believe in demon's doctrine say scripture (1 Tim. 4, 1, etc.). These are the doctrines of demons (taken from a "common Christian" trumpet: I believe that in the incarnation, the eternal and timeless God stepped into the times and history of a human being, and to quote Kyrill of Aleksandria (375-444) - who played the lead role Ephesus's 43th Ecclesiastical Assembly in 431, and the importance of which he has gained is about his strong emphasis on the fact that Jesus is both God and man - "to combine humanity with one another as well as the head." The undivided church - the church before that big skisma in 1054 - was clear in his doctrine of Christ: Jesus Christ has two naturalities. On the one hand, He is the perfect God who has all that the Father has while He is perfect man-yet without sin (quote end). God has never become human, then the scripture contradicted itself and we should burn the Bible. Trinity doctrine is demon's teachings to make it clear. Jesus did not have two natural ones, but one (Jesus was a perfect person almost equal to Adam before he sinned, but with a developed spirit that was perfect). And God filled him with his spirit so that he could do the deeds and speak as he did. Jesus never assumed that he was "god," but led and filled with the spirit of God. Acts 10. 38 Jesus of Nazareth was anointed of God with holy spirit and power, and he walked all around, doing well and healing all who were deceived by the devil, for God was with him. 1. Tim. 1. 17 He who is King of eternity, the imperishable, invisible, one God, be praise and honor forever and ever! Amen. The Father is the invisible only true god, not jesus, he is his only begotten son. From my Bible Comments Hebrews 10. 1. The law has only a shadow of the goods that should come, not the things themselves the way they really are. Year after year, victims are still being the same, but with these the law is not able to make them sacrificed, perfect. The law was good but temporary. We must never look down on the law because it expresses the will of God. But it requires obedience and tells only the truth that we humans are not able to do in ourselves. Room. 7. 12 Then the law is holy, and the commandment is holy, right and good. Because God's Father was never 100% satisfied, it was ceaselessly committed with sacrifices, as the law says that the sinner should die. 2 Otherwise, had they kept sacrificing? For if those who attend the worship service had been cleansed once and for all, they would no longer have any consciousness of sin. But it was not only God, the Father who was not satisfied, but those who lived under the law as well. Even the High Priest who went into the holiest one year a year could not be 100% sure if he came alive alive, therefore, a string was bound around his foot in order to pull him out, in case he died under God's judgment. 3 But sacrifices are a reminder of sin every year. But anyway, this has its positive sides. It tells that humans are sinners who need salvation. Knowing our needs is the first step in the right direction. 4 For the blood of bulls and bows can not take away sins. Then comes this which is obvious: the blood of bulls and bows can not possibly remove sins. Had they been able to do that, sin had been removed when the law was in operation for about 1400 years and millions and hundreds of billions were sacrificed, especially during the holidays in Israel. We read that he also had to become one of us in order to save and redeem us. Joh. e. 1. 14 And the word became human, and dwelt among us, and we saw his glory, the glory which the only begotten Son has from his father, full of mercy and truth. 6 You did not care about burnt offerings and sin offering. It was never the Father's perfect will that animals should die for some people to go free. But in order for him to be able to marry and show mercy to the children of Israel, it seemed temporary and partial condemnation. But it was only when the Son Jesus Kristus that life and immortality were brought to light and we human child could fully out taking part in salvation and a complete remission of sins. 7 Then said I, Behold, I have come to do your will, O God. The scroll is written about me. Jesus did God's will to the letter. But he also had the necessary qualifications to do so entirely. It was all for him. Joh. e. 4. 34 But Jesus said to them: "My food is to do the will which hath sent me, and to complete his work. 8 First he says, "Sacrifices and gifts, burnt offerings and sin offerings you would not have and did you not care," yet it is such sacrifices borne according to the Law. Had the law brought consummation, eternal bliss and salvation had the law been good enough and sacrifices, gifts, burnt offerings and sin offerings have been able to save. Had it not been any sense that the Lord Jesus came. 9 Then he says: "Behold, I have come to do your will." He abolishes the one that has first mentioned, to let the second apply. By Jesus' entry into the world happens for a substitution. All the law stands for will be replaced with grace and life in Christ Jesus. In Galatians the fourth chapter, Paul says so strongly when he writes. He compares the law by the slave woman and what would one do with her? Crazy. 4. 30 But what saith the scripture? Get rid of the slave woman and her son! For the slave woman's son will not share the inheritance with the free woman's son. 31 Therefore, brethren, we are not children of the slave woman, but of the free woman. 10 By virtue of that will we have been sanctified through the body of Jesus Christ was sacrificed once for all. This scripture here is very powerful. Law remains unchanged for the even just and the wicked human. But we die away from it all and Jesus both Savior and sanctify us through and through. When we experience what Paul writes in Galatians. 2. 20 I no longer live, but Christ lives in me. The life I now live in the flesh I live by faith in the Son of God who loved me and gave himself for me (end of quote). Jesus is not God with big G, but God Father! Now it is not easy to say the right in the mouth when the Bible is so mistranslated and written in such a misleading way for it to concur with the occult doctrine of the Trinity. The Bible is not written in capital letters, etc. but in lowercase and therefore it is man-made writing Jesus is God in uppercase. Jesus's divinity, by virtue of what the Father has bestowed on him, and through the work of salvation. But the early Christians emphasized that Jesus was the savior, Lord, ward head etc. And he even called himself the Son of man, never even for God , but God's son. Therefore, it is so incredibly wrong not to go in depth and see that Jesus is the firstborn of all of us to become like Him and thus be Gods, which is God's goal for all His creation, to be to the praise of his glory !